This week-long tour of North Korea provides a a good overview of the country with visits to many of its top cultural and historical attractions. 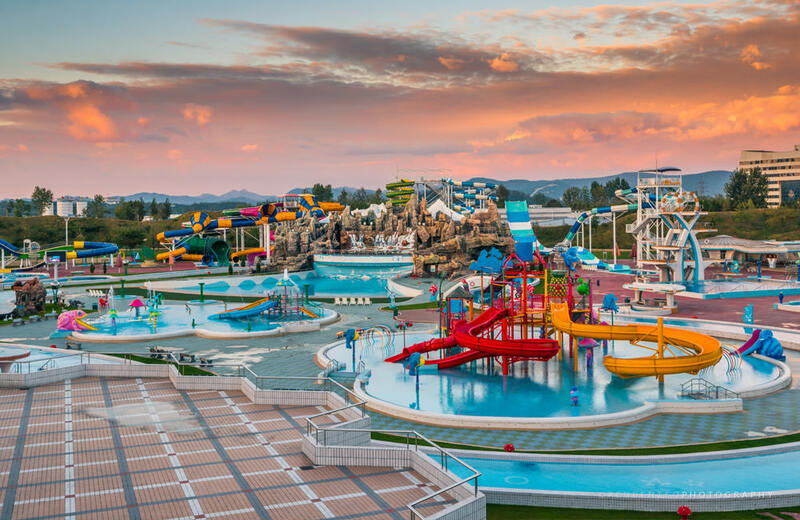 See Pyongyang’s epic monuments, stand metres from the South Korean border at the Demilitarised Zone (DMZ), stand inside buildings from Korea’s dynastic past, and get splashed with water alongside locals at the country’s biggest water park. 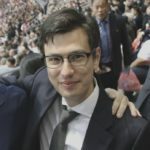 This tour will be personally led by Tongil Tours founder Alek Sigley, who will be nearing the end of his two year-long master’s degree in Korean literature at Kim Il Sung University. Alek has a depth of experience living in North Korea and Korean language ability that few in the North Korea tourism industry can match. And he looks forward to being your guide! 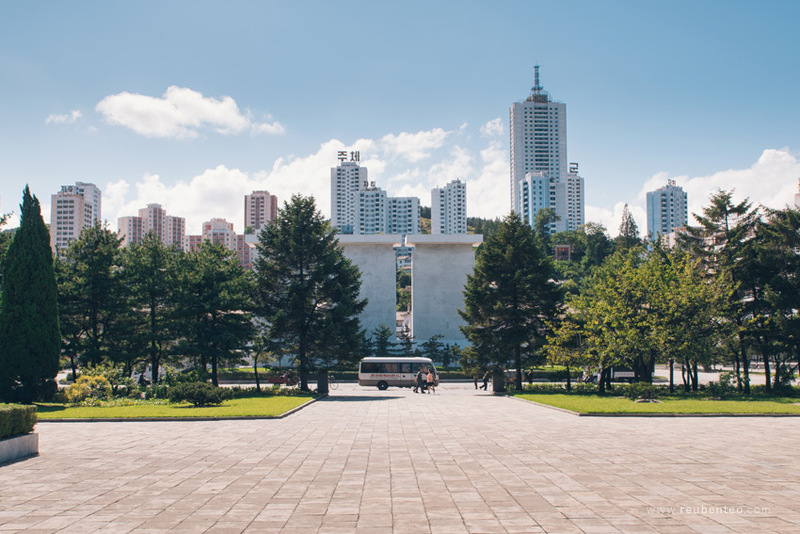 More Pyongyang attractions; ride the elaborate Pyongyang Metro, visit the mausoleum where North Korea’s leaders have been put to rest, and visit a local middle or high school. Visit Wonsan, a port city on the east coast, and soak up some of its seaside vibes. Visit North Korea’s 2nd largest city, Hamhung. Please note that minor changes in itinerary may apply for reasons beyond the control of Tongil Tours. 10 AM (Beijing time) – A Tongil Tours staff member will be ready to meet participants in Beijing International Airport. Assemble at Koryo Air flight counter in Beijing International Airport Terminal 2 for quick briefing session before taking Air Koryo flight JS 152 to Pyongyang. 12:55 midday – (Beijing time) – Estimated flight take off time. Flight time – approx. two hours. 3:30PM – (Pyongyang time, half an hour later than Beijing time) – Estimated time of arrival in Pyongyang. PM – Meet our Korean guides at Sunan International Airport. Half hour drive to Pyongyang. The largest and most famous pair of bronze statues of Kim Il Sung and Kim Jong Il that can be found in each of North Korea’s major cities. 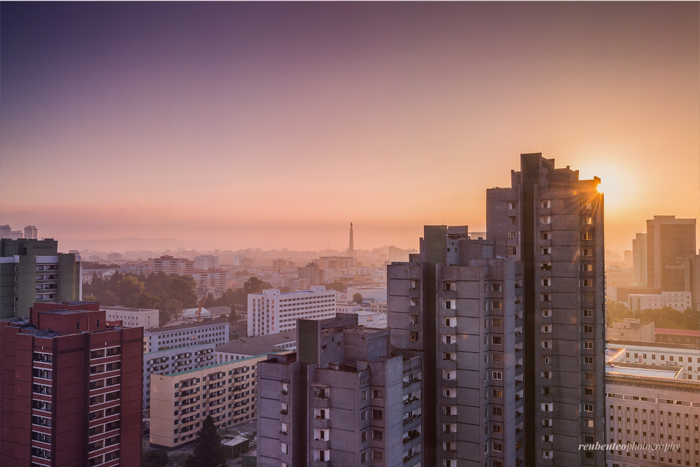 They are situated on a hill in the centre of Pyongyang offering magnificent views of the city. 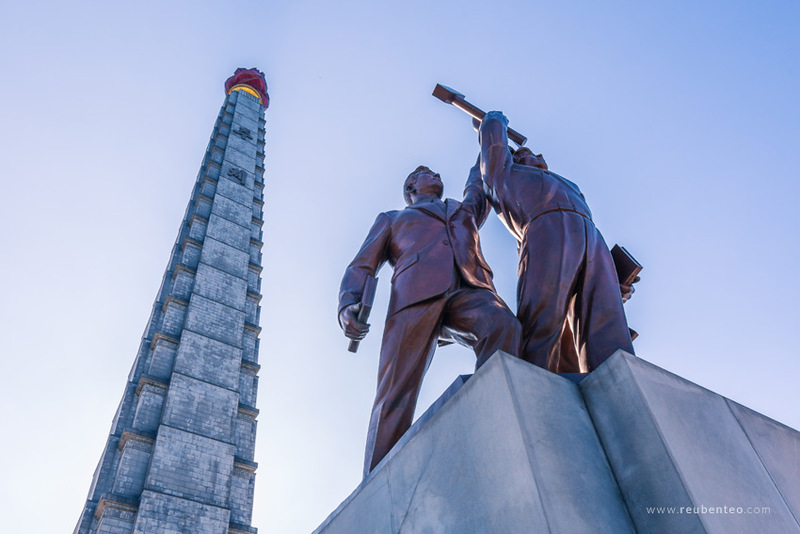 The statues are 22 metres high and flanked on both sides by elaborate sculptures, one depicting Korea’s struggle for independence against Japanese colonialism, the other dealing with socialist revolution. Overnight in the Koryo Hotel. Guests now have free time to use any of the entertainment facilities in the hotel (pool/billiards room, karaoke, bowling alley, shop etc.) or retire early for the night. AM – Breakfast in the hotel. The mausoleum where the bodies of Kim Il Sung and Kim Jong Il lie in state. It is a grand, sprawling complex surrounded by a large square and a moat. Visitors see the bodies of North Korea’s former leaders and tour exhibition halls displaying their possessions. On display are also the train carriages and a boat used to the tour the country on “on-the-spot-guidance” visits. Moran Hill (“Moran” meaning “peony”) in central Pyongyang forms a beautiful park which has been a popular leisure spot for locals since premodern times. Take a leisurely stroll through the grounds and enjoy the wonderful view of the Taedong River and centre of Pyongyang from Ulmildae and other Yi Dynasty pavilions atop the peak. On weekends and public holidays the park is full of picnicking Koreans engaged in drinking, song and dance. These are good opportunities to mix with the locals. Practice your best moves—you may be pulled into a dance! The humble thatched hut on the outskirts of Pyongyang where North Korea’s first leader Kim Il Sung was born and raised. Now a site of revolutionary pilgrimage and prominent North Korean cultural icon, visitors can see his family home and possessions and drink from the well. Usually busy with locals coming to pay tribute and take souvenir photos, especially on occasions such as the leader’s birthday and other public holidays. Containing 16 stops and two lines, the Pyongyang Metro is one of the deepest subway systems in the world. First constructed in the 1960s, it displays a similar grand style to its predecessor in Moscow, with stops featuring elaborate murals, mosaics and sculptures alongside ornate pillars and chandeliers. Visitors can descend into the subway down an escalator with a vertical depth of over 50 metres, and tour from stop to stop while riding in the subway trains alongside local passengers. A waterpark featuring indoor and outdoor sections with various waterslides, fountains, pools, diving platforms, children’s area, and other installations. A popular weekend leisure spot for Pyongyangites. Also features several restaurants and one of the best cafes in Pyongyang. After dinner, we’ll head to a local bar for some drinks. AM – After breakfast, we will begin the two-hour drive to Kaesong and the DMZ. 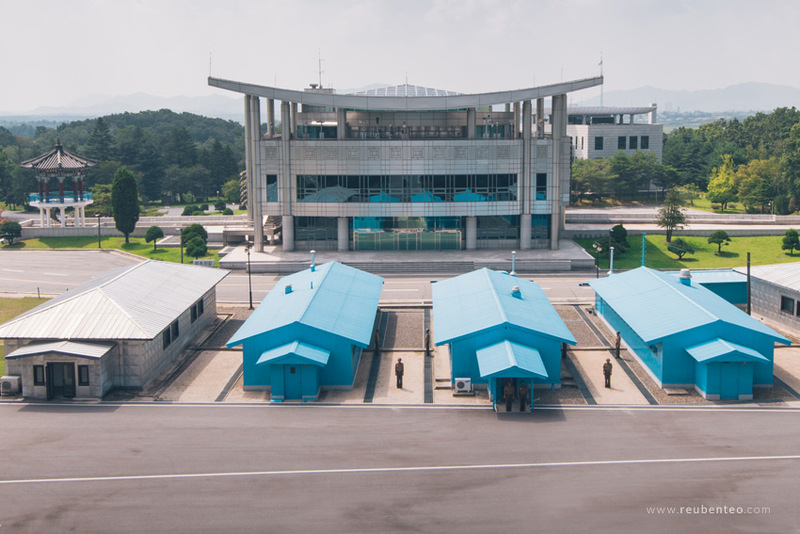 Here tourists can visit the Armistice Talks Hall, the Armistice Signing Hall and Panmunjom Peace Village (also known as the “Joint Security Area”) from the northern side. At Panmunjom Peace Village it is possible to view the south from metres away at the balcony of Panmun Pavilion. Get right up to the border with South Korea, even technically cross it in one of the negotiation huts which lie between the northern and southern sides of the compound and are bisected by the border. PM- After driving back to Kaesong, we will enjoy a lunch consisting of local specialties. This museum is dedicated to Kaesong’s past as capital of Koryo Dynasty Korea (which lasted from 919 to 1394 AD). Exhibits are housed in Kaesong’s former Confucian Academy (Songgyungwan), which was established in 992 AD and became the highest educational institution in Korea throughout the Koryo and Yi Dynasties. The present structures were built in the early 17th century. Next, a quick visit to the postcard and stamp shop across the road. Constructed in 1290, Sonjuk Bridge is a Koryo dynasty stone bridge located in central Kaesong City. It is well known as the site where famed Confucian scholar and statesman Chŏng Mongju was assassinated in 1392, generally believed to have been carried out under the orders of Ri Bangwon, son of the founder of the Choson Dynasty Ri Songgye because of Chŏng Mongju’s continued loyalty to the previous Koryo Dynasty. The bridge was closed to traffic in 1780 and made into a monument celebrating Chŏng Mongju’s loyalty. After viewing the monument, step out onto the street to get a glimpse of daily activity along one of central Kaesong’s bustling thoroughfares. Completed in 1372, this is the tomb of King Kongmin, 31st king of the Koryo Dynasty and his wife, Mongolian princess and later Korean queen, Queen Noguk. Consisting of two burial mounds adorned with stone carvings and statues on the top of a hill outside Kaesong, the site offers a splendid scenic view of the surrounding countryside. Drive to Sariwon, halfway between Kaesong and Pyongyang. A folk culture-themed street in downtown Sariwon adorned with traditional style gates, ponds and pavilions. Visitors can see reconstructions of some of Korea’s most famous traditional structures and cultural artifacts. Usually a popular spot for locals to engage in leisure. Climb the hill behind the park for a great view of Sariwon City. A large, multi-storeyed shopping complex located in the Kwangbok Street Residential District of Pyongyang. This shopping complex is extremely popular among locals and usually buzzing with activity. Here, visitors can exchange foreign currency for the local Korean won, and use it to shop for a wide range of domestic as well as some imported products. Ground floor contains a supermarket, 1st floor clothing and accessories, and 2nd floor a bustling food court. A great place to pick up interesting DPRK-made items and people watch. After breakfast, we will drive from Pyongyang to Wonsan city on the east coast of Korea in Kangwon Province (3.5 hours). Upon arrival in Wonsan we will have lunch, check out Kangwon Province Art Gallery (a small art gallery near the restaurant), and then visit the city’s central square and fishing docks. Later in the afternoon we will spend time mingling with locals on Wonsan’s Songdowon Beach. We will then visit Wonsan Agricultural University for a tour of the grounds before continuing on to Hamhung city (2.5 hours), the capital of South Hamgyong Province and the second most populous city in the DPRK. 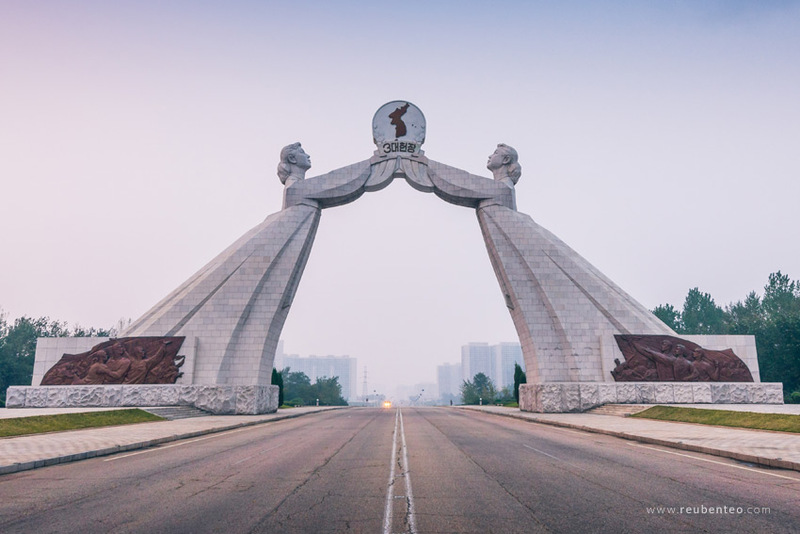 Upon arrival in Hamhung we will visit Sinhungsan Park (bronze statues of Kim Il Sung and Kim Jong Il on a hill surrounded by a landscape garden). Overnight at the Sinhungsan Hotel. After breakfast, we visit the Hamhung Grand Theatre at the city’s central square before driving to Tongbong County to visit a cooperative farm and meet local families (and possibly see the local kindergarten). We then drive to Hungnam industrial district, visit the Hungnam Fertilizer Factory, and continue on to Majon port on the east coast of Korea. In the late afternoon, we will return to Wonsan. Overnight at the Dongmyong Hotel. AM- After breakfast, we drive back to Pyongyang. The DPRK’s main art gallery situated in the heart of Pyongyang on Kim Il Square. Features permanent exhibitions of both premodern and modern art, divided into sections according to style (oil painting, Chosonhwa, sculpture etc. ), and arranged chronologically, as well as temporary exhibitions, all covering three floors. During this special extended tour we will cover all three floors in detail, taking our time to analyse and discuss the works. A top music academy where some of the nation’s finest musicians are trained. Here we will be able to learn about North Korea’s design practices and the urban planning of Pyongyang. Where the country’s future architects are trained. We will then visit a local Middle or High School, where we will be given a tour of the grounds and then drop in on an English lesson where we will be able to chat and interact with the students. 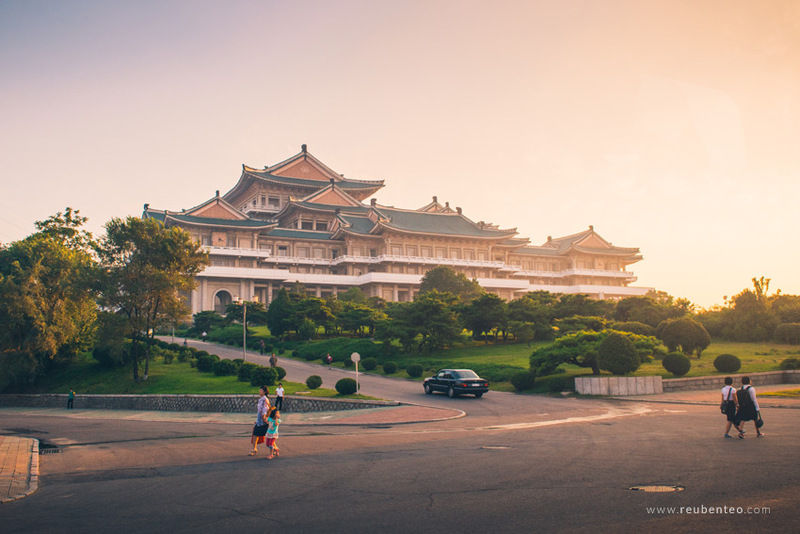 Located on Kim Il Sung Square opposite the Juche Tower in the heart of Pyongyang, this monumental building constructed in the Korean neoclassical style is North Korea’s national library. Visitors can enjoy a tour of the inside, the grandly-built lobby, reception, reading and study rooms, and finish off with the balcony which offers a wonderful view of central Pyongyang. The Victorious Fatherland Liberation War Museum is a museum dedicated to North Korea’s 1953 “victory” over the United States and its allies in the Fatherland Liberation War, commonly known as the Korean War in the West. Learn the history of the Korean War from the North’s perspective through elaborate museum displays and videos in the main hall, and see a grand panorama of the Battle of Daejon. By the entrance are war-themed monumental statues and displays featuring captured and downed American vehicles, tanks, artillery and planes. Visitors can also tour the USS Pueblo, which was in 1968 found in Korean waters and accused of being a spy ship, after which it was captured and taken to Pyongyang where it has been kept as a trophy ever since. Located along the banks of the Taedong River and opposite Kim Il Sung Square and the Grand People’s Study House in central Pyongyang, the Juche Tower is a monument dedicated to North Korea’s governing political ideology of Juche. The structure features a unique layered stone tower design topped with a torch which glows at night. A bronze statue of a worker, farmer and intellectual holding aloft the Korean Workers’ Party emblem decorates its base. Visitors can view the structure from the outside before entering to see the museum on the inside and taking an elevator to the top to enjoy a stunning view of Pyongyang. After, we’ll go for a stroll down the Taedong River and cross the Okryu Bridge. After dinner, we’ll visit Taedong No. 3 Beer Bar to try some of the local brew. 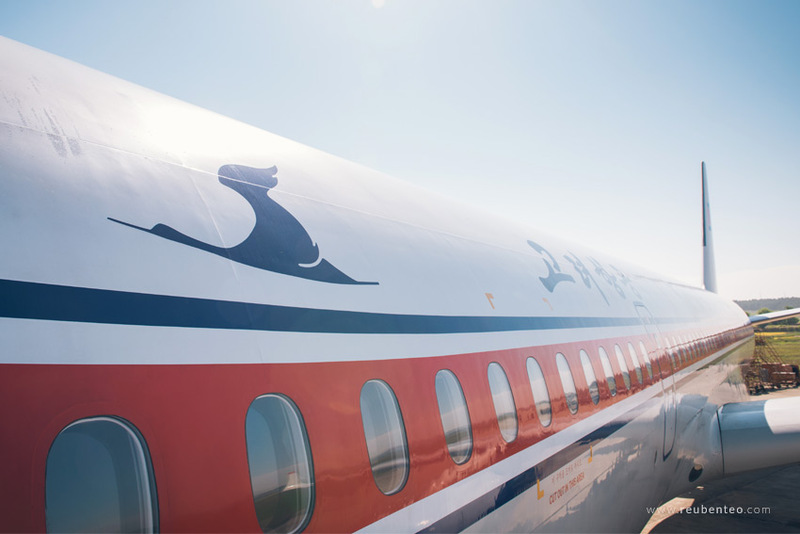 AM – After breakfast, we drive to Sunan airport for Air Koryo JS151 back to Beijing. 9:00AM (Pyongyang time) – Estimated departure time. Flight time – approx. two hours. 10:30AM (Beijing time, half an hour earlier than Pyongyang time) – Estimated arrival time. We conclude our journey in Beijing Capital Airport, Terminal 2. To ensure the best possible experience for all involved, we’ll have a dinner in Beijing the day prior to tour departure when we will go through some important points relating to the tour and allow an opportunity for any final questions. For anyone who can’t make it, we can quickly brief you before departure in Beijing. Before departure, we will send out a pre-departure email with general information to note for the trip such as what to pack, and other important information. 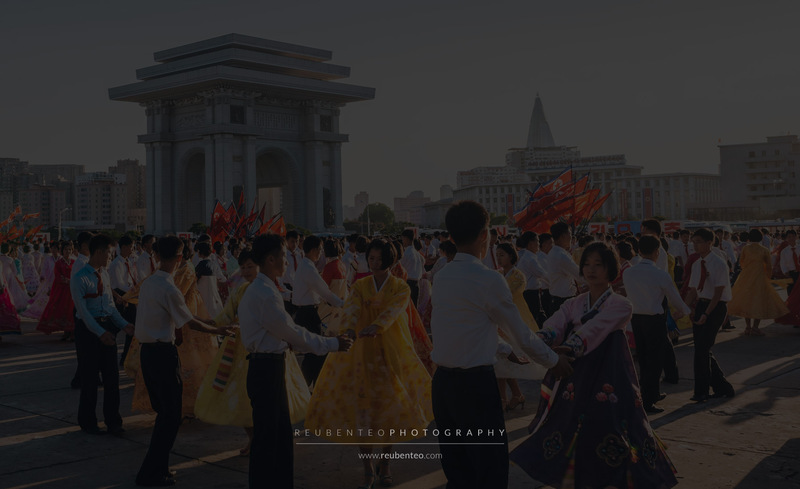 With all of our tours, we send our participants an optional reading list (consisting mostly of items either free for view on the internet, or that will be shared with participants) to assist travellers in contextualising their North Korea travel experience. This is sent to travellers after a booking has been finalised. These expenses are not included in the tour fee. It will be necessary to bring a little extra in cash – either Chinese yuan, Euros, or US dollars, into North Korea to pay for these expenses on the day. Prices are listed in euros, but may also be payed in USD or RMB. Note that prices are subject to change. Micro-brewed beer (a pint) – €2 euro approx. Munsu Water Park ticket — approx €10. For all enquiries please email info@tongiltours.com or fill in our contact form. EUR €1,950, also payable in AUD, USD or RMB. Deposit due at time of application. EUR €500. All trip prices are per person based on double occupancy. If you’re travelling on your own, we’ll pair you up with a roommate of the same gender so that you can pay the same rate as other travellers. Prices are subject to change based on North Korean rate changes. Prices do not include airfare to and from Beijing. Travelling to North Korea and China with Tongil Tours is easier than you think. observations and analysis from the Tongil Tours team.